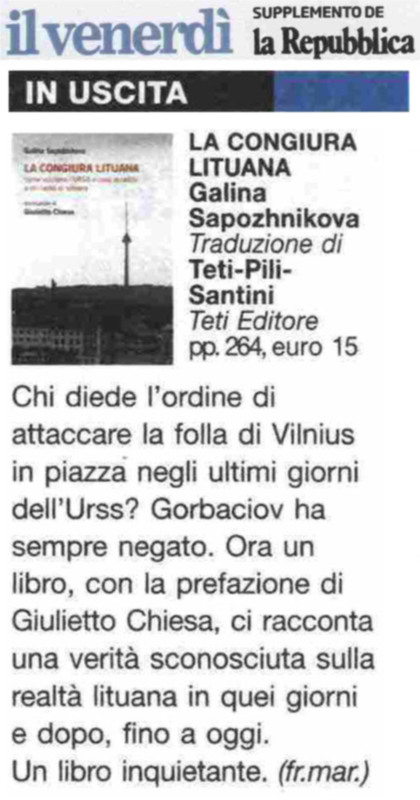 THE BOOK: What happened on the night of January 13th, 1991 at the television tower in Vilnius? Those events are recalled by many protagonists of the period that coincided with the Soviet Thermidor. 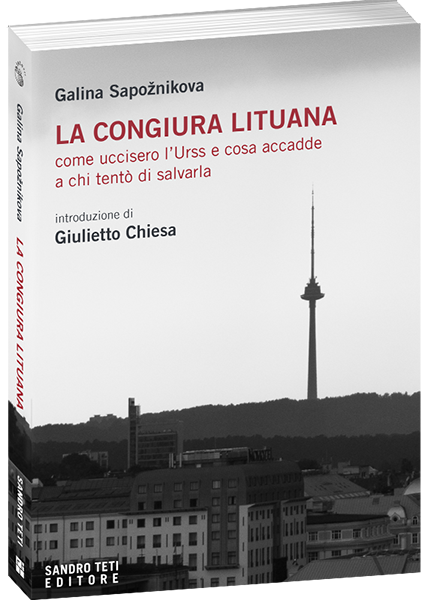 The book tells how Lithuania has become the testing ground for future “color revolutions”, and presents to Italian readers a version of the facts, different from the official one, which has been in recent years uncritically accepted in the West. Through detailed interviews conducted by the author it emerges as the new, free and independent Lithuania has persecuted not only many of the Russians remained in its territory but also political opponents. Galina Sapožnikova is a Russian journalist. She has graduated from the Faculty of Journalism of St. Petersburg and begun her career in the editorial staff of Molodëž’ Estonij. She became correspondent of Komsomol’skaya Pravda for Estonia, Finland and Sweden. She wrote many books on xenophobia and the Russian diaspora. She has won numerous journalism awards, including the prize in 2009 from the Russian Federation to release the best journalistic work with her book Arnold Meri: poslednij estonskij geroj (Arnold Meri, the last Estonian hero). Giulietto Chiesa is one of the most famous Italian journalists. He has been Moscow correspondent for l’Unità in the eighties, and he covered the same role for La Stampa during the nineties. Columnist and contributor to several Italian, Russian and American newspapers, he also worked with the major national television networks. In 2004 he was elected to the European Parliament. Chiesa founded and runs Pandora TV, an independent information platform that monitors in real time the main international current events.